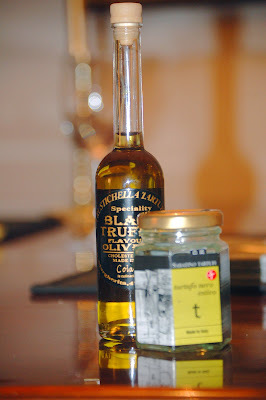 I was given really delicious gifts for Christmas: a jar of black truffles and truffle oil. Normally, I wouldn't spend the outrageous amount money for these two extravegant food items, ($19.00 for the 2 truffles and $15.00 for the truffle oil) but since they were a gift, I wanted to make sure they would be the star of the dish I would make with them. I employed the KISS (Keep It Simple Stupid) doctrine for these two special ingredients. Cook the angel hair pasta in lots of water until still al dente. Drain. Put the pasta back in the pan and add the truffle oil. Place the pasta in warmed pasta bowls. 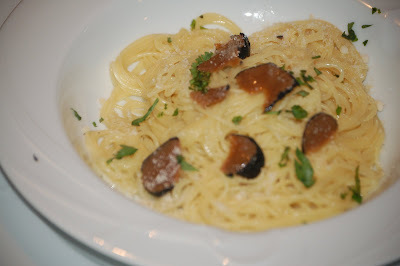 Equally divide and shave one black truffle between the pasta. Sprinkle chopped scallions over the pasta. Serve immediately. Serve with a really fine pinot grigio. Then go out for dessert. I want to send you an invitation to a pre-launch event for my start-up, which is working on a website that has to do with restaurants in the Boston area. If you'd like to hear more and receive an invitation please write me an email at adamgse@gmail.com. You're back!! Woo-hoo!! How are you doing? I've missed you. I have truffle oil, procured at a food show two years ago. I got it at wholesale price of $9.50 for 60ml. I have yet to open it because I just feel like I need to save it. But this looks easy enough to make and I could just use a mushroom medley instead of the truffles. I know I should use the stuff, but I guess I'm just too intimidated. A belated happy new year to you. I hope you're well. Welcome back, Isabella! This looks delicious. It's great to see you back on the web. You read my comments wrong. I did not mean to insult you, that was not my intention. My comments were directed at the subject of the post Jim Webb. I don't agree with you Mrs. Green when it comes to politics but I had no intention of insulting you. I am sorry. I can't bring muself to do truffles for fear of screwing up something that expensive! You know, every year I plead with the Husband and friends and family to give me things like truffles or artisan olive oil, or at least a gift certificate to Broadway Panhandler. But no. It goes unheard. I love what you've made with your presents! wow! talk about luxe pasta..
19 bucks for two truffles! That's a deal out here--I've seen anywhere from 38 to 75 for that, which is why I've never cooked with them. You pasta looks great! 2. Meanwhile, bet basketball finely grate the zest of one of the lemons; set aside. Cut a thick slice off both ends of the zested lemon to expose the flesh. Stand the lemon upright, then cutting from the top down, remove the peel, including all the white pith. 3. sportsbook Holding the lemon over a bowl to catch the juice, use a paring knife to cut along either side of each segment to free it from the membranes; let each segment fall into the bowl as you go. Once you’ve removed all the segments, squeeze any juice from the membranes into the bowl and then discard. march madness Remove the seeds and set the segments aside in another small dish. Measure the lemon juice in the bowl. Cut the remaining lemon in half and squeeze to obtain 2 tablespoons of juice in total. Thanks so much for this recipe, this is exactly the same way I use truffle oil. Yummy looking pasta! That's great!